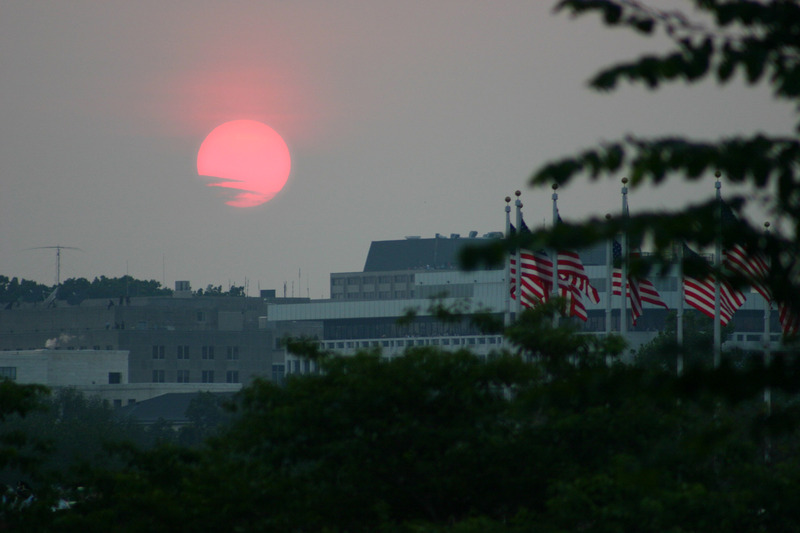 Back in Washington on the 4th of July, an ominous bloody sun hangs low over the horizon, a foreboding sign of things to come. With the resignation of Justice Sandra Day O’Conner, Congress declaring War on itself, the Republicans plot a total government takeover. Bush family forever… It’s the dawn of a new Empire in America, and dusk for humanity. That bloody sun casts a gloomy pall over Washington, where evacuation tests are have been set in motion for the 4th of July. Are they trying to tell us something? Is this a rehearsal for the final assault? Time to uncork the Pernod and celebrate Independence Day as a distant memory. Cheers to the setting sun!